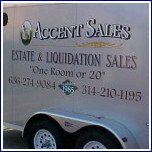 Accent will visit on-site to view the items to be sold. Issues including preparation, time frame and a tentative date for the sale will be discussed. Clients will be provided an information packet detailing the service Accent performs and the duties of the client. Our contract will be left for the client's review, signature and return to Accent.